The "Cortina" screen designed by Sebastiano Bottos is a sculptural piece of furniture handcrafted by assembling extroflexed wood elements, the result of an innovating processing technique that allows contortion of wooden panels obtaining a distinctive three- dimensional effect. Perfect as a centrepiece, jet even in a background corner able to remain a theatrical protagonist of the room. Completely designed and handmade in Italy. Different wood species, finishes, design and measures available under request. Bottos Design Made in Italy is a line of modern furniture designed by Sebastiano Bottos that continues a family tradition back to the early 1900s. Since he was a child he has always been surrounded by design classics, developing a natural affinity with the idea of modernity, the basis of his projects. His studies at the IUAV University in Venice and his successful participation in various international design competitions and exhibitions have further characterised his training. His remarkably heterogeneous collection of furniture is distinguished by a constant search for innovation : aesthetic research, new materials, advanced processing techniques and high craftsmanship thus give shape to pieces that are both distinctive and inspiring. Large intricately sewn suede screen or room divider with three adjustable panels. Suede has age appropriate texture and patina. A four-panel room divider with a single piece geometric constructed wood design and lower woven wood bottom section. Unique sculptural room divider. Designed and made by Rogan Gregory, USA, 2018. Unusual Art Deco style carved and lacquered screen, room divider depicting woman swimming surrounded by dancers, amazing work, hand-carved and painted. 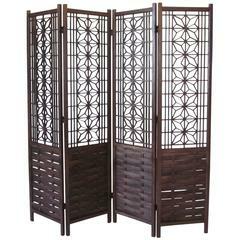 Sculptural three-panel midcentury bamboo screen room divider.